Assistive Technology (AT) is the use of technology to provide equal access to information. Assistive Technology Services (ATS) is an office in the Department of Disability Services that offers technology support services for students with disabilities such as audio books, adaptive software/hardware, alternative format materials, and equipment loan along with AT consultation, training, resources and support. If you think you may benefit from a technology accommodation, ask your Access Coordinator for a referral for an AT Assessment. If you don’t know who your Access Coordinator is, contact Disability Services. An assistive technology specialist can advise you on technologies that may work for you based on disability need and abilities. If you qualify for accommodations through Disability Services, the equipment and/or software you need may be loaned or made available to you at no charge. ATS supports and provides training for adaptive hardware and software used to accommodate disabilities. The ATS staff may be able to answer general questions regarding student computers and adaptive software. 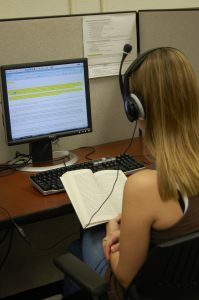 Although any registered student may use the open access computer workstations and printers, only students who are currently registered with Disability Services may use ATS extended services which include audio books, textbook scanning, adaptive hardware and software checkout, accommodation consultation, and assistive technology training. Students that wish to take advantage of extended services such as audio books, scanning, etc., need to register with the main Disability Services office EVERY SEMESTER they wish to use services and/or equipment. Requests for alternative format materials should be submitted through the Get My Books website. Funding for alternative production is supported, in part, by The Association of Former Students. Additional software and hardware is obtained and installed on a case-by-case basis. Many of the larger classrooms and auditoriums on campus have assistive listening systems built in to the sound system of the room. See Communication Access Services for more information about these locations and how to obtain a receiver.